In my attempt to grow more outside of my comfort zone, I downloaded Among Others by Jo Walton for some science fiction and fantasy reading. It's not normally genres I read, but the few times I have, it's been fairly enjoyable. I guess for me it's an acquired taste, like coffee or wine. I have to regularly try it so I can get more used to it and eventually love it. Outstanding bloggers recommended this book (full list below). With those strong supporters, combined with an appealing synopsis of the story that includes fairies, magic, the 1970s, Wales, England, boarding schools, and science fiction, all captured in journal entries, I knew it was something I needed to read. It was a bumpy road at first, but I'm glad I read it. It is a science fiction reader's dream to read Among Others, but it's a reminder that reading does much more for you than just while away the time. This unique coming-of-age tale may incorporate fantasy elements, but it's also about the angst of teen life, the confusion of new friends and first loves, the grief of the loss of family and the awkward steps of meeting new relatives for the first time. Most importantly, it's about finding meaning in your own life by reading books. It's 1979 and Morwenna Phelps is fifteen-years-old. Just one year before, she and her twin sister played with the fairies that hovered around the ruins of Welsh castles near her home. When their mother began to use more and more dark magic that became a danger, they knew it was their responsibility to fight back. Morwenna ends up losing her twin, and suffering a painful limp for the rest of her life. A year later, Morwenna has run away from her mother and taken in by her once-absent father and his three sisters. Shipped off to boarding school, her coming-of-age tale is told through journal entries which capture six months of her life, relaying the interactions with new friends at school and her new family at home, and the steady ache of loss without her sister. Although magic is an important piece, it's actually quite subtle in the overall story. It must be remembered that Morwenna is an avid journal writer, so the six months we get to read is only a snippet of her life in which fairies and magic are the norm. The more "real" parts for the reader that are easiest to comprehend are the very rough spots of pain that Morwenna feels as she struggles to find a sense of balance in her new life. She is every bit a teenager who has all of the normal challenges being a teenager can bring, but she also has an added responsibility of dealing with magic and fairies in a world that doesn't believe. To have a mother who is the very source of evil, naturally draws a heavier burden for her. Morwenna's escape from it all is reading. She voraciously reads dozens of books a week and falls in love with the "interlibrary loan" which allows her to order books from other libraries. Her stash of reading is never empty, and though she occasionally reads historical fiction, it is science fiction that captures her heart. It is the one connection she has with her father, who is also a passionate reader of the genre. So here's the success of this book for me: What it effectively did do is motivate me to read science fiction from the 1970s. It seems like this is one of the peak periods when sci-fi became even more popular. Because of that, I did head to the library this weekend and picked up Ursula le Guin's The Lathe of Heaven...and I read it in one day. Granted, it is a short book at less than 200 pages, but it's not often that I read a book that quickly. The review is coming this week and I can proudly state I loved it! More science fiction for me! Read this if you like science fiction and fantasy books, or if you like stories about boarding schools and magic (even though it's much more than that!). If you are new to science fiction, push through the first entries; you'll eventually get to the rhythm and flow of the story and will find it comfortable, quiet, and a pleasant read. If anything, it will definitely make you a bit more curious about the science fiction section in the bookstore/library. It did for me and I am ecstatic that there is a new genre for me that I never thought to do anything more with than dip my toe into it. I can't wait! Jo Walton was born in Aberdare, Wales and is a Welsh-Canadian fantasy and science fiction writer and poet. 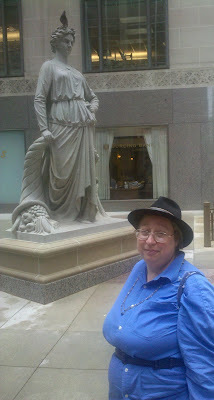 She won the John W. Campbell Award for Best New Writer in 2011 and the World Fantasy award for her novel Tooth and Claw in 2004. Her novel Ha'penny was a co-winner of the 2008 Prometheus Award. Lifelode won the 2010 Mythopoeic Award. 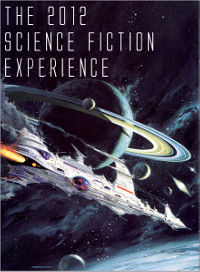 This is my first selection for the Science Fiction Experience hosted by Carl at Stainless Steel Droppings. All reviews from participants can be found here. Outstanding review! I haven't heard of this book, but it sounds like something I would like to read. I'm not a huge fan of Science Fiction, but I have been pleasantly surprised on several occassions by this genre. I found you on Goodreads, I'm so very glad I stopped by. Love your blog design by the way! Glad you enjoyed it. I need to read this one. It's been on my list for so long I don't even want to think about it. Interesting. This might work for me. Cool cover too. I do like boarding school stories but I'm a little nervous about science fiction and fantasy. I keep meaning to try this one...good to know you liked it! I'm glad you liked it. One thing i didn't talk about in my review was that I was so engaged in her story, and in her love of science fiction, that I got upset when she started dissing Stephen Donaldson. It was sort of strange. I have read a lot of the authors she talked about, but it motivated me into putting Brunner's Stand On Zanzibar on my TBR pile. This is a title I tried to read years ago, and was slightly intimidated by, but Macmillan put it out in audio, so I'm gonna try and give it a listen. Although I've read a lot of reviews of this book, and heard it referenced so many times (most recently on the Bookrageous podcast a few days ago, when I reminded myself - yet again - to seek out "Among Others"), I didn't know much about it beyond, you know, boarding school, magic, being a teenager. Thanks for such a thorough review. I now want to read the book even more than I did before, though i suspect I'll run into some of the same problems you did with the sci fi references. I haven't read much beyond Ender's Game and the occasional classic pushed onto me by some friend (The Stars My Destination is the biggie here), so I'm sure I'll miss a lot of what's happening in Walton's writing. Still, what a great book this would be to read and then revisit after reading some of the referenced titles, as you're doing. Can't wait to read your review of the le Guin, too! I also don't read much science fiction, but would love to know where to start with it all. My husband loves it, but often the books he reads are too advanced for me, and I get lost in all the jargon. It sounds like this book might be interesting in two ways. First, for the story it tells, and secondly because it might help me to put together a list of science fiction titles that I could explore. This was a wonderful review, Natalie. I enjoyed it and got some really great ideas from it! Oh, wow -- great review. This isn't a book that's been on my radar, but it sounds lovely -- your comments especially have me excited. I like scifi in the theoretical but always get confounded by the science and I haven't read many of the classics -- so I'll be prepared to be slightly lost on that count. I'm not a big Science Fiction reader. I'm not sure why but I never have been. I would definitely give this one a try though. I'm so glad you read (and enjoyed this!). If it makes you feel any better, I'm a fan of scifi/fantasy and hadn't read the majority of Morwenna's well-loved books. But like you, I still wound up loving this book... such a love letter to the formative power of books. Great review! I've been wanting to read this since Carl first reviewed it on Stainless Steel last year. But alas, I'm still like number 50 on the holds list at the library. Perhaps I'll have to interlibrary loan it from some library where no one reads SF. It's always fun to see your reading directions expand and change. Before I started blogging I would have sworn that I wouldn't read fantasy or sci-fi but now I read it all the time. Nice review. I really need to carve out some time to read this one. I've heard so many good things about it and as a life long scifi reader I'm probably the target audience.